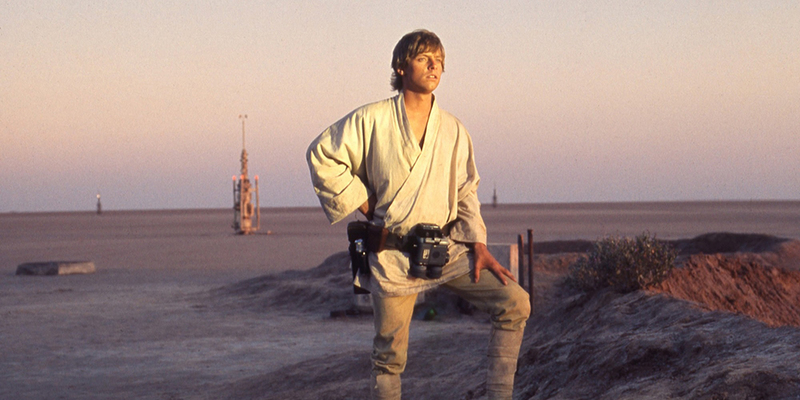 Mr Jalco, today, thinking about original Kenner Star Wars toys while staring into the middle distance. *WARNING* There follows an entirely self-indulgent post, where I basically whoop and holler about some old toys you probably won’t be interested in. You’ve been warned. “You dad’s been cleaning the loft out.” This is the kind of conversation starter that my mom would usually choose to brace me for the fact that either dad’s fallen through the ceiling (again) or they’ve finally discovered what was causing that odd smell in the corner of the kitchen and, lo and behold, your old pet cat’s been in the loft for the last ten years and has rotted into the rafters. Not this time. No familial injury. No dead pets. Just toys, glorious, wondrous toys. But first a little background. I’m a man of a certain vintage, the kind of vintage that had all the best toys growing up (I pity Millennials, their childhood toys are uniformly cheap and nasty). My parents weren’t well off by any means, but were very generous. And the (mostly second-hand) shops and car boot sales of my childhood were stuffed with Commodore 64 games, Star Wars toys, Gen-1 Transformers, LEGO, M.A.S.K. models, Fisher Price Alpha Probe/Alpha Star toys etc. Frankly, it was paradise for a geeky, sci-fi and comic obsessed kid like me. 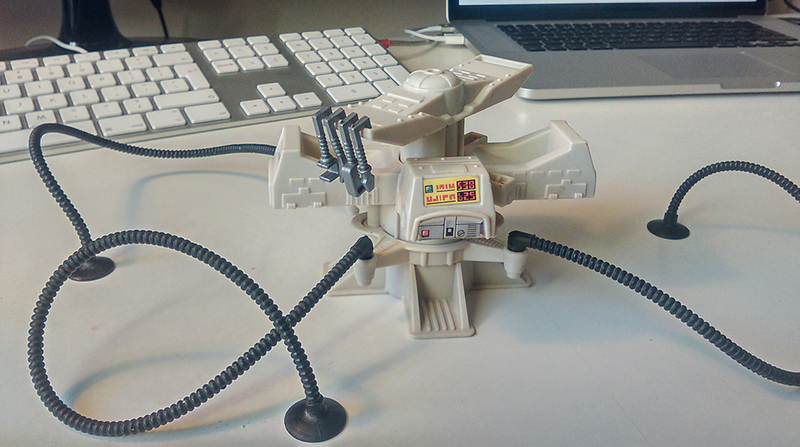 If you know what this is from and watched it first time around, chances are you had some excellent toys. 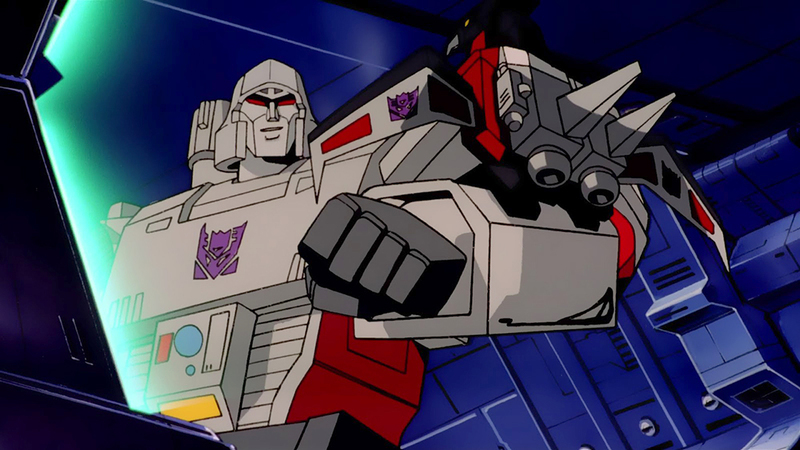 Gen-1 Transformers: Optimus Prime, Megatron, Grimlock, Sludge, Jazz, Hoist, Bumblebee, Cliffjumper, Cosmos, Astrotrain, Metroplex, Ultra Magnus, Cyclonus, Scourge, Blur, Highbrow… the list goes on. Those are the ones I can remember, but there were a couple of dozen more, at least. Star Wars (aka the one that really hurts): At least a couple of hundred original figures (including rarities like Yak Face, the FX-7 medical droid, and double-telescoping Darth Vader, Luke and Obi-Wan models), the Millennium Falcon, AT-AT, AT-ST, Slave-1, Rebel Transporter, X-Wing, Tie-Interceptor, A-Wing, Y-Wing, Snow-Speeder numerous smaller vehicles, accessories and collectibles of all kinds. That’s a collection worth, at today’s prices, a couple of grand. And it would be appreciating. 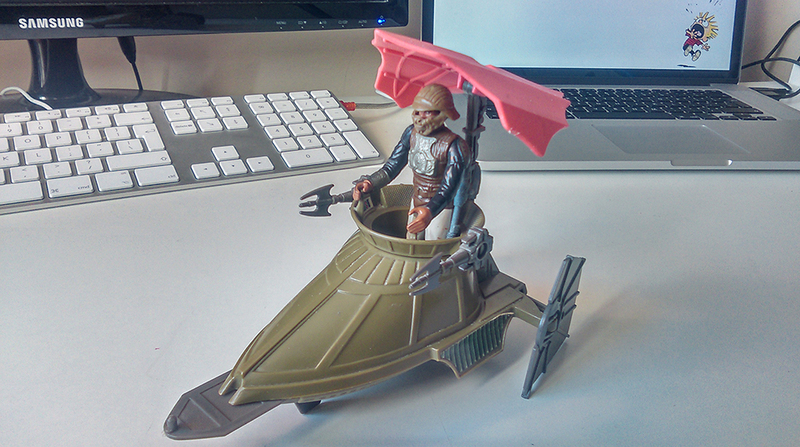 Not to mention the general cool factor of all those original toys. To say we regret it is like saying that Krakatoa was “a bit of a bang”. I did not need asking twice. I was pretty intrigued as to what might be in the box, as I was certain my brother and I had sold everything. I was pleasantly surprised. Not only was there some reasonably cool stuff in there, but once a decade or two of loft dust and spider filth had been wiped away, it was (mostly) in remarkably good condition too. As an adult (yes really, shut up), I have begun to slowly rebuild a small collection of geeky/sci-fi toys and collectibles from my childhood. Mostly Star Wars related, but anything from the 70s/80s that’s interesting and in good nick will do. So this little bonus was a real delight. 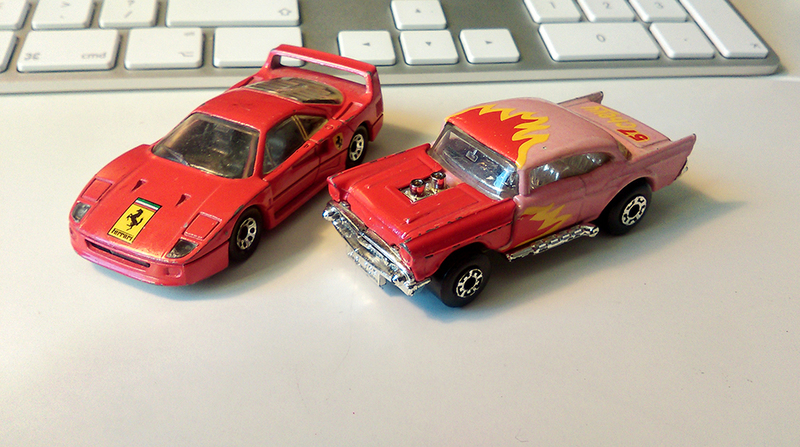 1988 Matchbox Ferrari F40 and 1979 Matchbox ’57 Chevy Bel-Air. This is where a petrolhead was born. 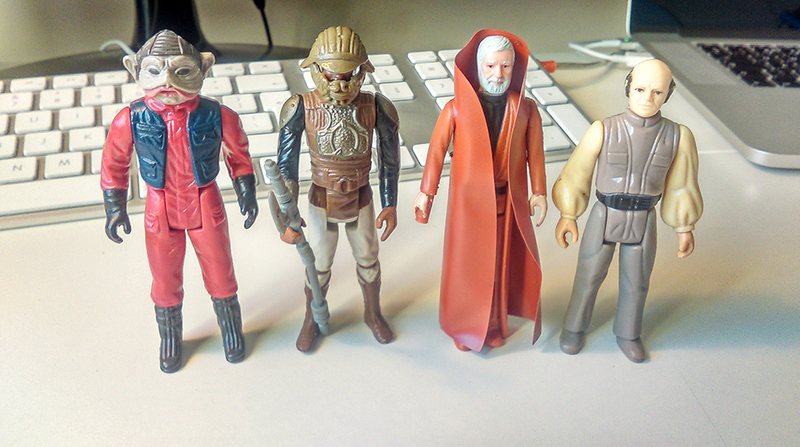 Original Kenner Nien Nunb, Lando in Jabba’s Palace disguise, Obi-Wan (sans telescopic sabre, sadly) and Lobot. Shuttle crew Tydirium (at least part of it). Leia, Luke, Hand and the Star Wars equivalent of “that guy in the red shirt”. 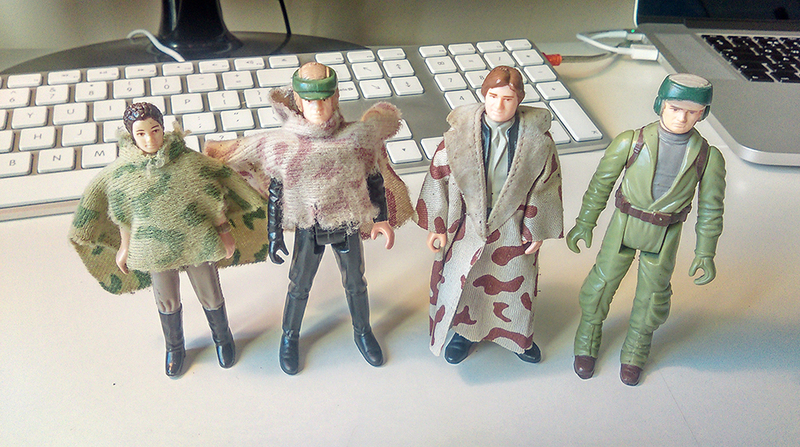 A speeder bike rider, Palpatine (looking a mite boss-eyed), Admiral Veers and an AT-AT driver/pilot/walker/whatever. 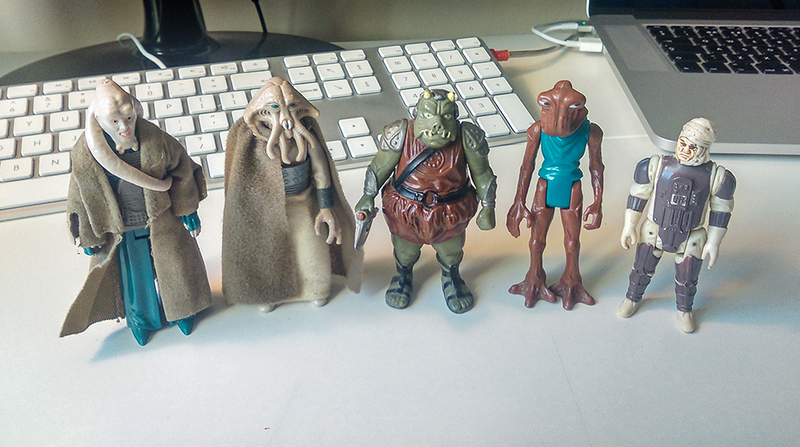 Bib Fortuna, Squid Face, a Gamorrean guard, Hammerhead and Dengar (one of the bounty hunters hired by Vader in TESB). A Hoth Wampa! 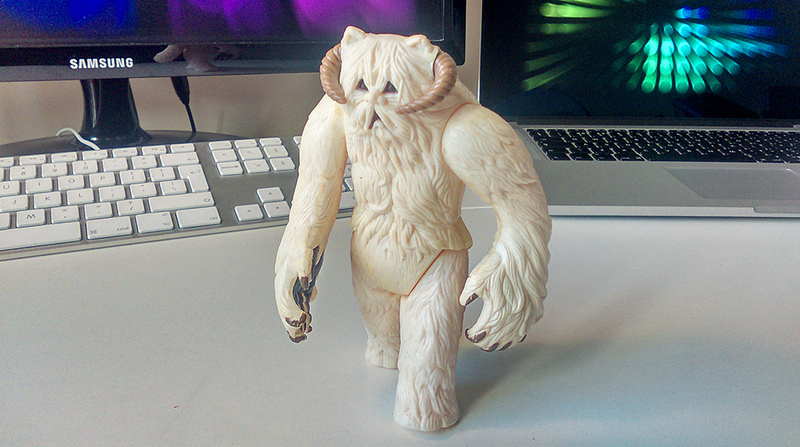 An original Hoth Wampa! Honestly, I was so made up about this, I thought it was gone forever. I think this is a rebel refuelling/tool station from Yavin IV. I think. One thing I do know for sure, I’ve no idea how those tools haven’t got lost after about 20 years in the loft. 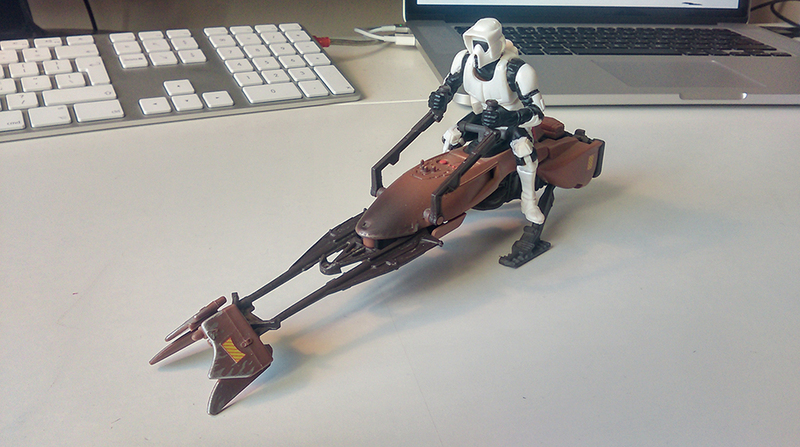 It might be an early-90s model, but I love speeder bikes. And I’ve always thought the Scout Trooper suit was the best of the original trilogy Trooper designs. Love it. Another Lando in disguise figure (why are there two? ), this time in a Desert Sail Skiff Mini-Rig. I was extra-happy about this one. 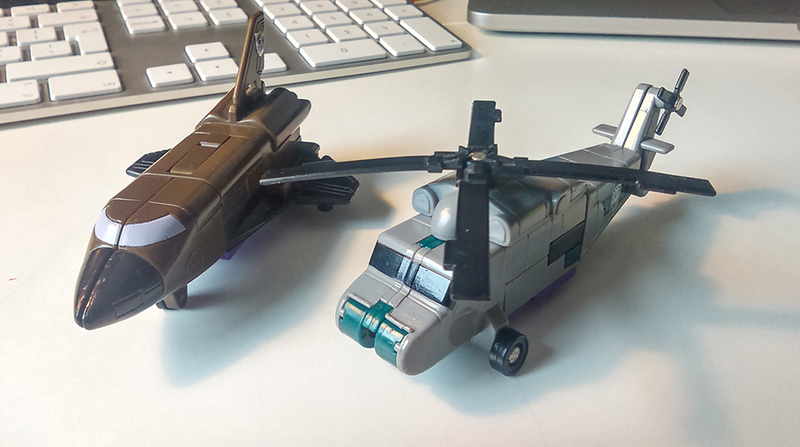 A couple of Decepti-creep Combaticons in the form of Blast Off (shuttle) and Vortex (helicopter, obviously) – Gen 1 Transformer goodness. I can’t believe they’re still in one piece. Right. 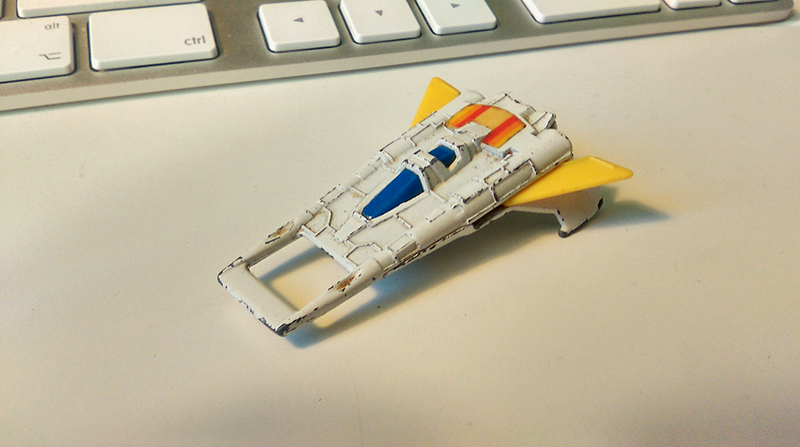 So, I think this is Buck Rogers ‘Thunder Fighter’ from the late-70s/early-80s show. It’s a pretty neat looking thing, except that someone has chewed off the two plastic jet engines and then clearly bashed it about a bit. What kind of savage does that? 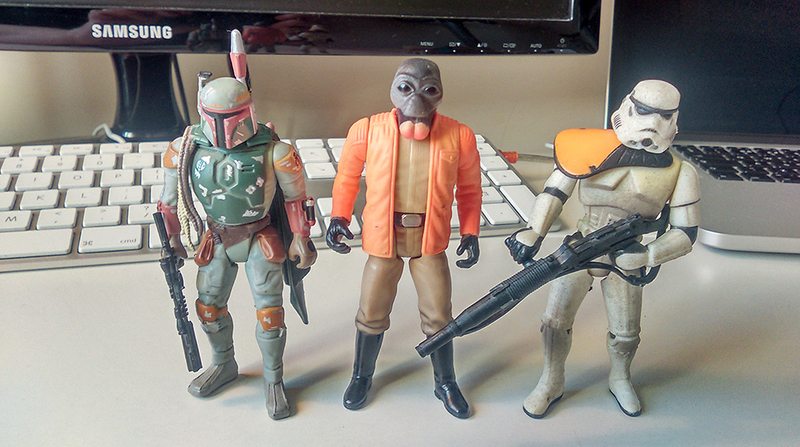 Mid-90s models of Boba Fett, Ponda Baba (before Obi-Wan gave him an arm-ectomy) and a Sand-Trooper. All looking massively buff for some reason. Why did mid-90s toys do that? 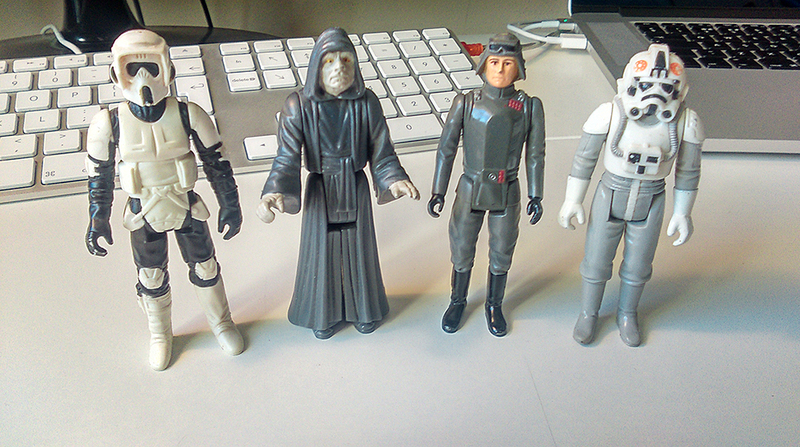 Again, stupidly hench figures abound in the mid-90s Star Wars range. 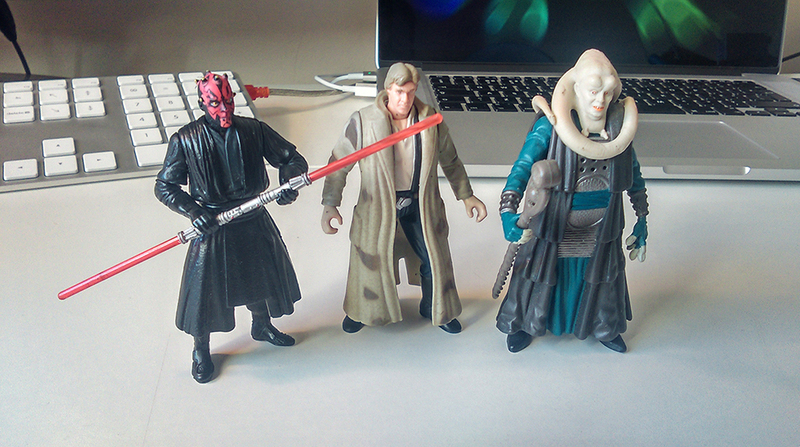 Darth Maul’s the only one that looks even slightly realistic. Han has spent a few parsecs in the gym and Bib Fortuna is particularly bloated. Very strange. 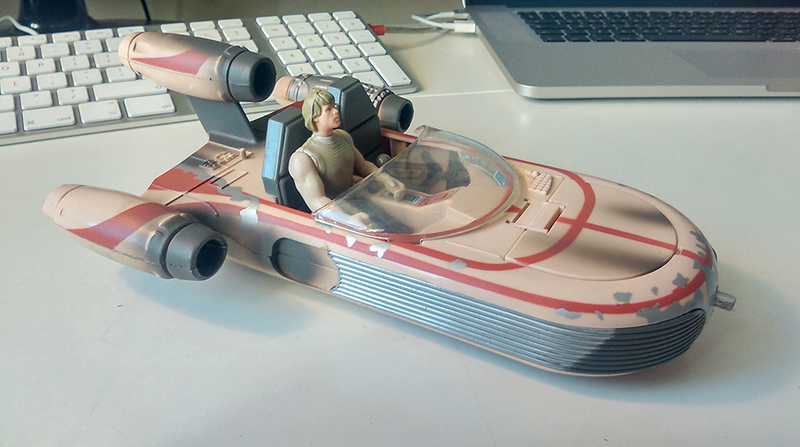 Luke’s X-34 Speeder. 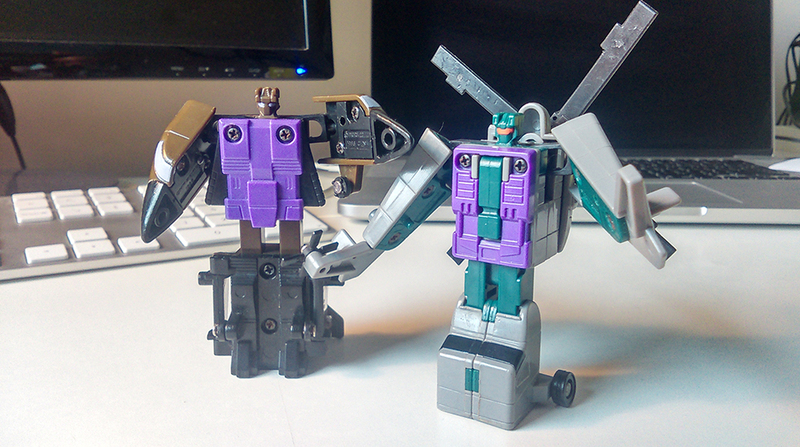 I quite like this model, even though it’s a 90s issue. But check out Luke’s guns! I didn’t realise the Jedi encouraged steroid use. What is going on here? So it’s a mixed bag. Some cool bits and pieces to add to my collections and some filler (I’m being kind). Still, as an excuse for a trip down memory lane and a few minutes (okay, hours) spent looking at Kenner Star Wars collections on eBay, this particular loft clearance was great. The only negative moment in this whole experience? I unpacked these at my parents house. At one point I actually whooped (when I found the Hoth Wampa). “You’ve never grown up, have you dear?” said my mom, shaking her head with an unspoken “where did it all go so wrong” hanging in the air.